We have kitty ! Our kitens. Welcome to the website of André and Larisa. We hope that our website will give you all the information you’re searching for. Our greatest passion is breeding British Shorthair cats and naturally we do this with all our love. We also have two daughters who help us raising and nursering the cats. Together with our daughters we participate in various cat shows throughout the country. We expect kittens on regular basis and of course wee will give them all our attention. British cats are really fond of company and they know how to appreciate it. Before they leave their nest they’ll be vaccinated. From the first day they are born we carefully control the health of our kittens. They’ll get several medical controls. We’re doing all these precautions just to make sure that our clients will remind us as being professional breeders. We only feed them with products that have achieved a certain fame, like Royal Canin, Sanabelle, Animonda, Feline Porta 21. We follow the precautions for when a kitten can be bought: a kitten remains for a minimum of 13 weeks in his or her nest. In this period (minimum 13 weeks) all kittens will be chipped, vaccinated twice and worms will be removed four times. Our cats can be bought immediately after a show o rafter a period of ten days at our home. For all our sweet kittens we’re looking for potential buyers. Don’t hesitate and take a peek on our website. We’re truly happy with the opening of our cattery and enjoy day after day our passion; a passion that can become your company some day. 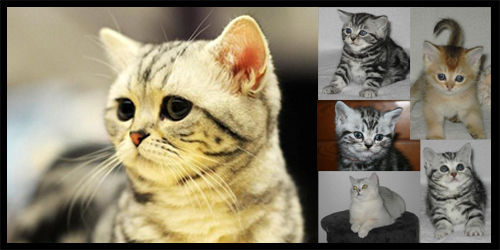 We wish you all the joy while getting to know our British Shorthairs.